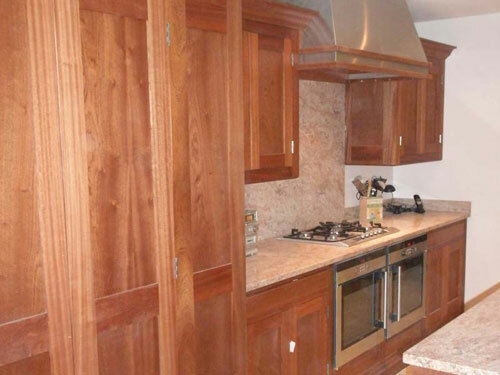 Jameson Joinery manufacture bespoke kitchens to suit their clients personal tastes and needs. In addition to the basic kitchens associated products which include plate and wine racks, tables, chairs, utility rooms, larders are also available. Kitchens, Jameson Joinery is a kitchens manufacturer company for corporate or private clients in the UK Sussex including London, Brighton and all the other surrounding areas. 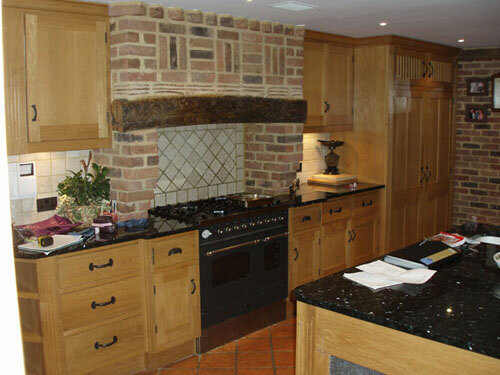 An oak country kitchen fitted with hand made ironmongery and granite worktops. 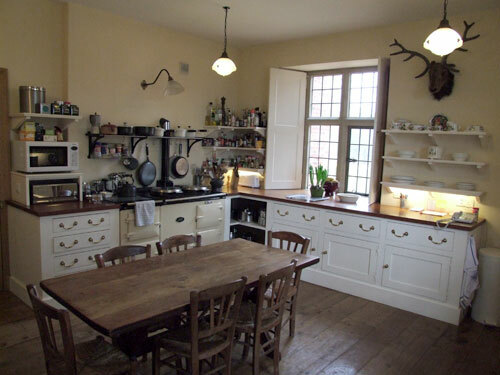 the fridge and freezers are housed in the tall cupboards on the right hand side with mullions in the top doors providing ventilation. This is a painted Douglas Fir kitchen fitted with 50 mm thick Canadian Rock Maple worktops and a french farmhouse sink. The panels have been left unpainted. 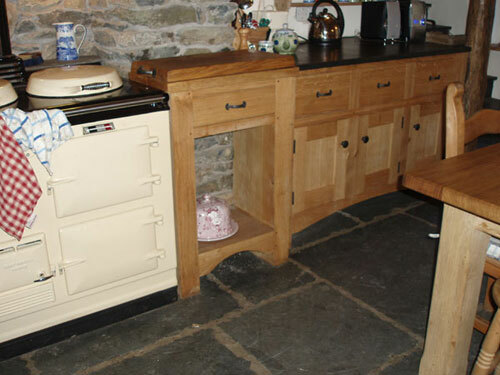 This kitchen is a Rustic Cottage kitchen made in English Oak installed in Cumbria. The floor is Cumbrian slate, and the ironmongery is hand forged iron and not brass hinges have been used. 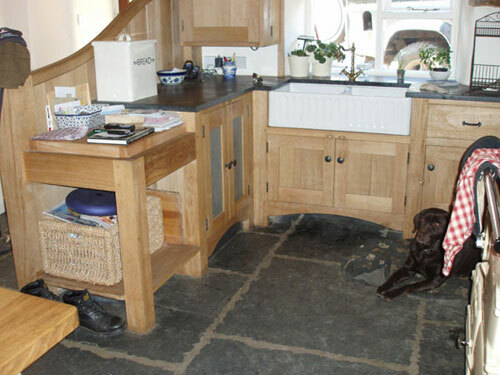 Another view of the Cumbrian kitchen showing a stable stall being used as a partition. The dishwasher is housed behind perforated mesh doors, and a pie crust sink fitted under slate 40 mm thick worktops. A contemporary mahogany kitchen where brushed finish is given to the stainless steel fittings and extractor housing. 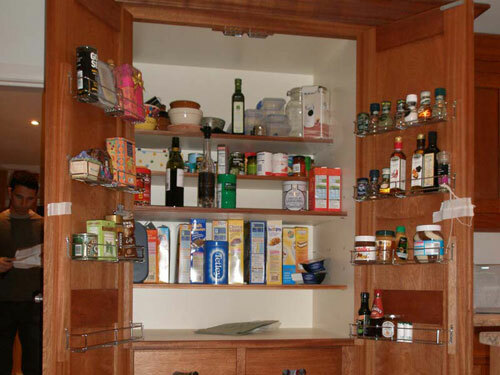 This is a view of a larder in the mahogany kitchen. 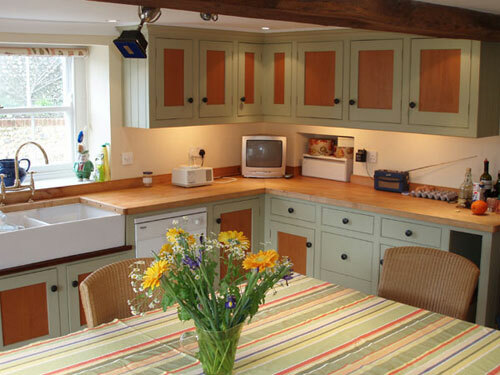 A Victorian painted pine kitchen encorporating Teak worktops and traditional brass drop handles. The English Oak floor is hand finished, the boards ranging from 200 to 350 mm in width.